Over 25 top musicians converge on Southern California for this four-day event held in two cities (24/25 Jan in Santa Ana, CA & 26/27 Jan in San Diego, CA). Featured will be live concerts every night preceded earlier in the day by artists/instructors teaching in small groups. Also available are special fan VIP packages including one on one meet & greets. More details on the VIP packages as well as links to purchase tickets for each event are available HERE. Additional artists to be named soon. The Friday & Saturday events will be held at Malone's (604 Dyer Rd., Santa Ana, CA 92705 ph (714-979-6000). Friday will revolve around the theme of the worlds first Super Group & greatest Jam Band... CREAM! Each artist will have a full set deriving songs from this classic era of music. Kofi Baker's EXTREME CREAM MkIII with Roy Z & Mark Boals will open the night. Headlining the night will be EXTREME CREAM MkII with Uli Jon Roth & Kofi (as an added note of historical importance, MkI is Mike Keneally & MkIV is Gary Hoey). In between the jamming bookends of Uli & Roy will be full sets from Doug Aldridge's new band STEAMROLLER, Michael Angelo Batio playing his entire Hands Without Shadows - A Tribute to Rock Guitar and CGP - CRAIG GOLDY PROJECT with Elliott Dean Rubinson, Vinnie Appice and Mark Boals! Don Dokken & Uriah Duffy are scheduled to guest. Saturday at Malone's will feature James Kottak of the SCORPIONS teaming up with Uli Jon Roth as they play early era SCORPIONS with a few surprises thrown in! Performing during Uli's set is CGP-CRAIG GOLDY PROJECT & Don Dokken is scheduled to guest. 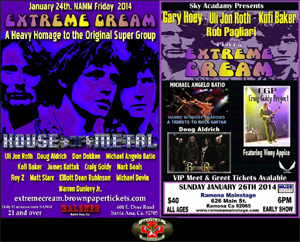 Sunday January 26th at Ramona Main Stage (626 Main St., Ramona CA 92065 ph# (760-789-7008) http://www.ramonamainstage.com/ features Headliners Gary Hoey playing EXTREME CREAM MkIV with MkII guitarist Uli Jon Roth. Also on the bill is Michael Angelo Batio performing an extended Hands Without Shadows - A Tribute to Rock Guitar, CGP - CRAIG GOLDY PROJECT w/ Vinnie Appice & Doug Aldrich's BURNING RAIN. Monday's Ramona show features an all day Sky Academy Seminar with Uli Jon Roth & guest instructor Craig Goldy (Certified by the State of CA) teaching song writing. Guitar luthier Jim Palmer from Guitar ER http://theguitarer.us/ and 111 Guitars will be giving a presentation on the importance of having a properly maintained guitar and how it is an essential link for inspiration & top-level performance. Jim will be offering complimentary guitar set ups & consultation valued at $100. The evening features James Kottak of the SCOPRIONS joining original SCORPIONS guitarist Uli Jon Roth for a full set of early SCORPIONS classics. Separate tickets for live concert performances, Sky Academy instruction, VIP meet & greet sessions for Friday, Saturday & Sunday afternoons are now available for each of the four events through the venues web site Ramonamainstage.com & brownpapertickets.com.